***You celebrate when your kid decides he likes a food, even a seriously unhealthy one, like corn dogs or chicken nuggets. At least it's protein, you think, I'll worry about his arteries later. Right now, you're more focused on getting calories into the kid than on how healthy those calories are. And you just pray those multi-vitamins are doing their job. ***You hope that there are enough nutrients in ketchup to make up for the fact that he won't touch a vegetable with a 10-foot pole. ***When you have to go to a party, you always, always feed your kid ahead of time and don't even bother trying to get him to eat at the gathering. And yes, you cringe and bite your tongue when Aunt Bertha makes snide comments about how spoiled your kid must be, and that in her day, kids weren't given a choice, they ate what was put in front of them, because if the kid is really hungry, he'll eat, all the while reminding yourself that Aunt Bertha never had a kid with autism or SPD, and she has no idea what she's talking about. ***Reading nutritional labels has become a way of life for you, not so much because you are dieting, but because you're desperate to find versions of the foods your kid will eat that have more nutrients and fiber and less sugar, preservatives and colors. ***You envy those parents whose children will eat mundane foods (like soup and pasta) with a vehemence that is surprising. You also have trouble not rolling your eyes at those parents who whine because their "picky" children won't eat onions or green peppers. ***Parenting magazines make you laugh when they give suggestions for helping picky eaters. The issues these authors address are so minor league, you can't help but sigh in exasperation. If all it took to get your kid to try a new food was cutting it in fun shapes, you'd have had this figured out years ago! Danny wakes up, complaining about how tired he is. He's so, so, so tired that he can't even walk to the kitchen table for breakfast. His dad finally carries the exhausted, tired, tired boy to the kitchen where Danny can barely keep his head up while he eats his "Cookie Crunch" cereal. Danny spends the rest of the morning whining and complaining about how tiiiiiiiiired he is, how he can't move his legs, they won't work, because they are so, so, so, so tiiiiiiiiired. The moaning and groaning intensify when I inform Danny that it is time to get dressed. This is when he claims that his legs are paralyzed and that he is unable to take his pajamas off, let alone put clothes on his limp and lifeless body. Danny: I'm soooooo tired mom! I can't go to church! I can't MOOOOOOOVE! Me: Just take off your pajama bottoms; it's time to go to church. Danny: I can't! I don't want to go to that Jesus Church, anyway. Me: So, what church do you want to go to, then? Danny: (after some deliberation) I want to go to a Lego Church! Cut to three hours later upon arrival home from church. Danny runs at top speed to his bedroom, where he flings off his clothes and hurriedly dons his pajamas, with no assistance from anyone. With more energy than a litter of puppies, Danny dashes around the house, gathering up Legos and playing with abandon. He can scarcely tear himself away from playing long enough to eat lunch. I'm tempted to point out to Danny that he has just proven to me the value of our church attendance, that he has, as my dad would say, "Pooped in his own nest," so to speak. After all, before church this morning, Danny was crippled, but now he can walk. What else could be the cause, but the miraculous healing powers of church? I'm thinking Danny might not agree. When my son, Danny was diagnosed with high functioning autism a year and a half ago, the doctor asked if he had any "special interests." I knew what he was asking; I had heard and read plenty about "passions" or "obsessions" or whatever you want to call them. I know they are relatively common among children with autism. At the time, I couldn't really identify one specific passion of Danny's. And to be honest, I was a bit relieved to know that there was one autism criterion that my son did not meet. Shortly after that doctor's visit, Danny discovered Legos, and our whole world has been engulfed in a cyclone of those pesky multi-colored blocks. To say that Legos have become Danny's "special interest" would be a gross understatement. The kid is completely, 100% obsessed. He talks about them, plays with them, reads about them and surfs the Internet to find more Legos to covet. His face lights up like a Christmas tree when he sees the Legos logo or hears someone talking about them. Haircutting scissors from Wal-Mart.......$25/8 haircuts a year/3 years = oh, heck, I don't know, but it's not much, right? There have been times when I have been so stressed out over some aspect of autism that I wanted to scream at Danny and possibly spank him. I know that this doesn't help in any way, but I don't think I would be human if I never lost my temper with my kids. Now, before you call DCFS on me, my kids are not in danger. I don't believe in spanking and have only done so a handful of times. Still, dealing with Danny's autism and SPD is incredibly stressful and it's difficult to keep from losing it sometimes. As I have pondered the question of what special needs families need, I have come to several conclusions, the most important one being that there is just not enough support out there for families with autism, at least in most communities. I know in some cities and regions there are clinics and therapists and so many great programs, like summer camp and drama groups, but I think that is the exception rather than the rule. Whole regions of the world suffer from dearth of help, and one of those regions happens to be the one in which I live. We have virtually no autism services here in this area, and definitely nothing in our city. The autism program for our state is located over 30 miles away, despite the fact that there are many, many kids with autism in my very city. I am in the middle of arranging with them to come to our city to start a social skills group here, so that we don't have to drive so far every week, but it's a challenge. The director informed me that if we want a group here, I need to find a place to meet and enough families to make it worth their while to come to us. I understand that they are busy and overworked, but so are parents of kids with autism. In an ideal world, these state-funded agencies would be all over the place and would have the money and manpower to do all the legwork themselves. Because the thing is, families with kids with autism need support. A lot of support. We need social skills groups, therapy and fun activities for our kids. We parents need opportunities to socialize and vent with other parents, because so often we feel completely isolated, and we rarely feel understood. We need more education about autism and therapy and intervention. And we need a break. More often than not, though, most parents have no leftover energy to devote to arranging support groups or negotiating with a state program to get services closer. Interestingly, all of the activities we have here in our town (that I know about, anyway) were started by moms of kids with autism. We have a very casual, unofficial support group which meets at a cafe to laugh and commiserate. Any other groups we have here, like a monthly potluck group and a play group we had in the summer were also started by parents of kids with autism. I know of many online groups--all started by parents, too. I am so grateful to these moms, but the thing is, most parents are already typically so overwhelmed, it's almost inconceivable that it would be up to us to find our own support sources. Thankfully, there are so many moms and dads of special needs kids who have the determination, strength, and motivation to reach out and start these types of groups. Unfortunately, there is still just not enough support, and there are parents out there who are so overwhelmed, depressed or panicked that the last thing they could handle is organizing a support group or negotiating with some state agency or the school for more services. I don't really have any answers. I know the government is totally financially strapped and can't be counted on to raise money for these types of organizations. Even though the number of families with autism and special needs is a huge portion of the population and it would be a wise investment to fund more support services, we cannot rely on the government to be there for us. So, I guess that's why moms and dads like me and you need to continue to push for services and organize parental groups. And that's especially why we need to be supportive of each other and not get embroiled in judging or arguing about treatments. We need to be able to lean on each other, we need to feel less isolated and more understood. This is why my new goal is to start reaching out more--online and in person--to parents who seem overwhelmed. And that's why I am going to make myself go to our support group more often and get to know the other moms in my area. Who knows? Maybe I'll actually help one of them feel a little less alone and overwhelmed. And I know they'll help me feel the same. This post is my contribution to Danette's SOS Research Blog Carnival, the BoB. Click here to read wonderful posts on family life and special needs. About.com is hosting a blog contest, where all the contestants are blogs for special needs parenting. Hartley's Life with Three Boys is in second place, but we're hoping to rally the votes so she can win. I happen to contribute to Hartley's blog on a monthly basis, so it's pretty exciting to me that the blog is getting this level of recognition, but that's not really the reason I'm asking you to vote. I'm asking because Hartley and her blog have helped hundreds of parents and kids with special needs. In fact, she's probably helped even more than that. She personally set up the SPD Blogger Network which is a network of SPD parents from all over who support each other and who spread the word about SPD. She also works with the SPD Foundation on all kinds of projects to educate people about SPD. Truly, I don't even know about all the work she does, because there's so much she's doing. 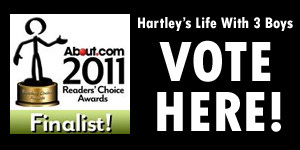 So please consider voting for Hartley's Life with Three Boys. You are able to vote once a day through March 8th, and it only takes a second. Over the last couple weeks, there have been some almost imperceptible changes in Danny, changes which now that they are adding up, are beginning to drive me nuts. Lately, there are certain aversions that Danny has developed seemingly out of the blue, which have been throwing a major monkey wrench into our days. Certain foods, like chicken nuggets, which he previously practically lived on, he is now eschewing. I know that can be normal for most kids, but his diet is so limited as it is, I am at a loss as to what to replace them with. On top of that, he has become even more choosy about his wardrobe. Shirts that he used to love, like his Lego or Bakugan shirts are now on his list of fashion don'ts. This limits him to about 2 or 3 shirts that he's willing to wear. Not only that, but as soon as he is able, he changes into pajamas. At the weekend, it's nearly impossible to get him to wear clothes. Now, I know these changes hardly make for crises, but I already felt at my limit; now, I feel like we are revisiting battles that I had thought we had won. Or ones for which we had at least negotiated adequate treaties. The worst challenge of all, though, is that about two weeks ago, Danny started having accidents again, and I have no idea what to do about them. I don't know if it is his diet or a sensory issue or what. Just when he had been having huge success in that area, it all falls apart. I know I am whining and that other parents have it much, much tougher than me. I know there are people out there who have chronically ill or dying children, or children who need constant care. I know my problems aren't enormous when put into the proper perspective, but try telling me that after a bad morning like today. The zipper on Danny's coat broke, so he ended up in tears. Even though he has two other winter coats that friends have given us, he refused to wear them. Yet, the prospect of wearing a coat with a broken zipper was distressing, even though the coat also has a set of snaps. What was I supposed to do? Bear with me if I sound whiny, but just once I would like one area of Danny's life to go smoothly with no help from me. I just want one part of his life to be easy. I don't think I am being totally unreasonable here. Eating, dressing, going to the bathroom are all areas most 7 year olds can navigate successfully with hardly a second thought from their parents, right? Add to this the fact that Danny's grades have dropped a little bit and we are doing extra work with him, and I just want to scream. There is no part of Danny's life that is not something of a struggle. He needs extra help and coaching with schoolwork, and he gets frustrated pretty easily with that. Danny doesn't always want to go to school or church and fights us on it. Socially, he is still way behind and needs lots of extra support. We have to do his therapy at home with very little support from a therapist. All of this falls on my shoulders, and to be honest, I'm just sick of it. I love Danny to death, but sometimes I want to just shake him and make him be more flexible in things like his clothing options. Other times, like when he has an accident and has no idea why he didn't feel the need to poop, I just want to gather him up in my arms and make it all better. And lately, most days, I just want to yell at God. Why can't He, in all His omnipotence, just throw us a bone? Why can't there be one part of Danny' s life that I can relax about? As I typed this, I realized there is one part of Danny's life that has always been easy for us: his sleeping. I know that is pretty unusual for autism, so I suppose I should be grateful, and I am, believe me. So, perhaps I should just end this rant and remind myself how grateful I am that my son gets 11-12 hours of sleep every night, which means I too get full nights of sleep regularly. If that's not something I should be thanking God for, I don't know what is. Darn it, and I was all revved up to keep ranting, but somehow the thought of Danny's fantastic sleep schedule has diffused it all.